The Operating Innovative Networks (OIN) workshop series, funded by the National Science Foundation, equips university and laboratory network engineers with the hands-on knowledge they need to build the next-gen campus data-intensive scientists need to succeed. The workshop series will be provided in collaboration with regional networking hosts around the country. Six workshops are planned, distributed among regions of the country. Details on dates and locations will be announced as they are finalized. 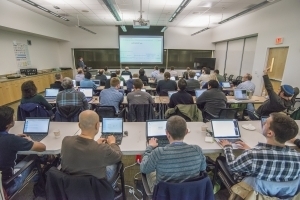 Presented by experts from the Department of Energy’s ESnet, Indiana University and Internet2, each workshop focuses on Science DMZ network architectures, perfSONAR performance measurement software, Data Transfer Nodes, and emerging Software Defined Networking technologies. Combined, these technologies are proven to support high-performance, big data science applications, while ensuring security and availability modern campuses and laboratories need. The workshops consist of two days of presentation material and in-depth hands-on exercises designed to encourage immediate adoption of these technologies. By the end of the event, attendees will have better understandings of the requirements for supporting scientific use of the network, and tools and strategies that can be used to mitigate problems users may encounter. **PLEASE NOTE** This event is open to individuals from the non-profit research and education community including government research agencies. Those interested from industry should email with your participation request including how your company is directly collaborating with the research community.